October 20, 2015 – Technicians at NASA’s Michoud Assembly Facility in New Orleans have completed more than 50 pieces of flight and qualification hardware for the liquid oxygen and liquid hydrogen tanks for the agency’s new rocket, the Space Launch System (SLS), and are ready to move forward with welding. SLS will be the most powerful launch vehicle ever built. The core stage, towering more than 200 feet, will store cryogenic liquid hydrogen and liquid oxygen that will feed the vehicle’s four RS-25 engines. The qualification hardware will be used to make test versions of the tanks. 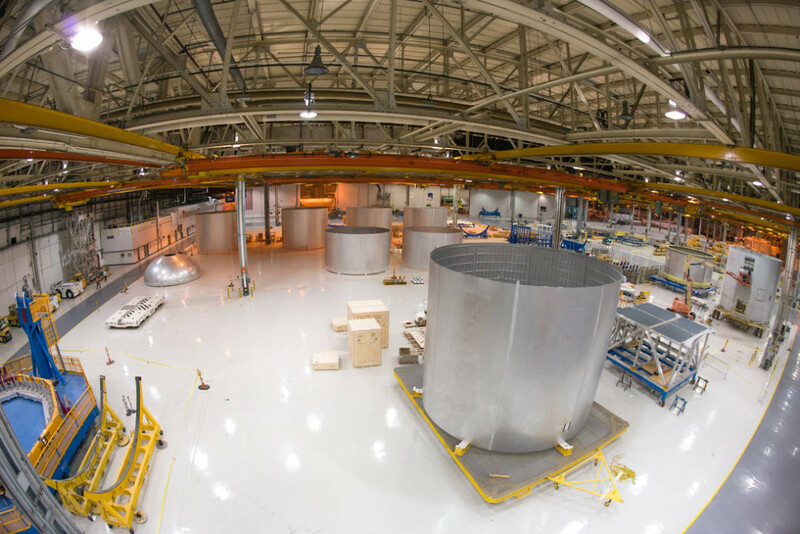 When completed, the test version tanks will be shipped aboard NASA’s Pegasus barge to the Marshall Space Flight Center in Huntsville, Alabama, for structural loads testing on new stands currently being built. The flight hardware will be used on the maiden flight of SLS, called Exploration Mission-1 (EM-1). EM-1 will be the first test of the fully integrated Orion and SLS system and is expected to launch in 2018. For EM-1, the SLS will be used to launch Orion into lunar retrograde orbit – a wide orbit around the moon that is farther from Earth than any human-rated spacecraft has ever traveled. The mission will last more than 20 days and will certify the design and safety of Orion and SLS for human-rated exploration missions. SLS and Orion will ultimately be used to carry humans to deep space destinations, including Mars. Lockheed Martin in Littleton, Colorado, is the prime contractor for the Orion spacecraft.